Fine, I said. You can’t really tell in the picture, but the finish had seen better days. It was scratched, scuffed and generally dinged up. 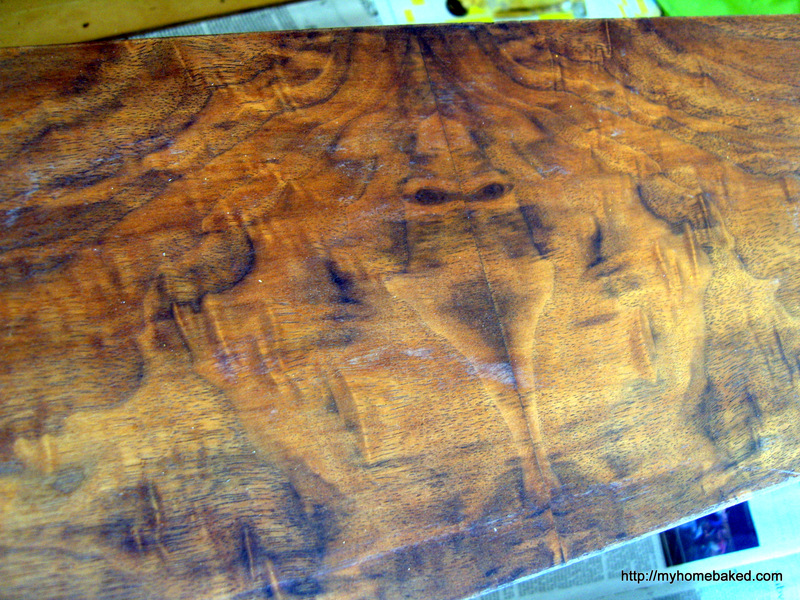 I didn’t want to paint it–see all those interesting wood grains? I decided a colored stain would be a happy medium. 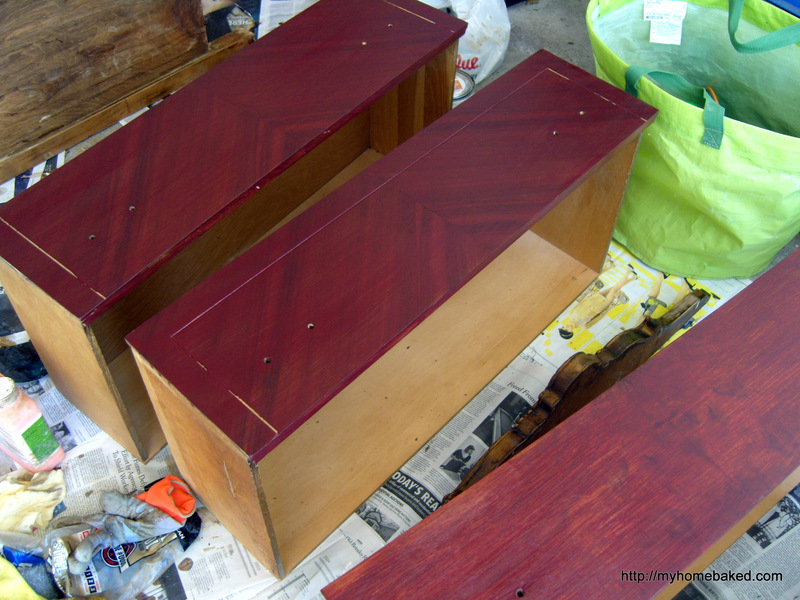 Miss Seven picked out a stain color (Sangria by Minwax), and then winter came and the project stalled. 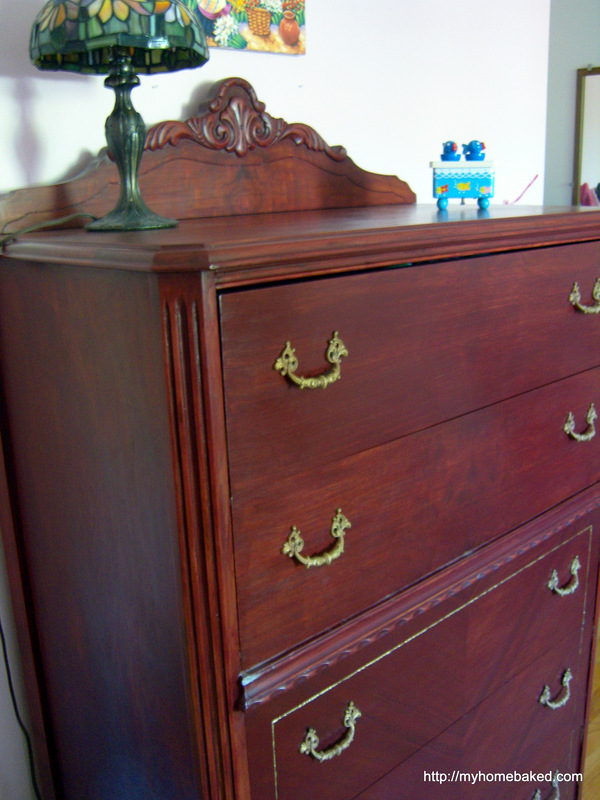 Eventually, the Hub and I carted the dresser downstairs and out to the garage, where I coated it in Citristrip. Lesson #1: Do not cover the whole piece in stripper if you don’t have time to scrape it all off the same day. That dried-on drippy gunk is a combination of stripper and old varnish, and it required a lot of elbow grease to remove with countless wads of steel wool dipped in more stripper. Elbow grease applied in short bursts over several weeks. 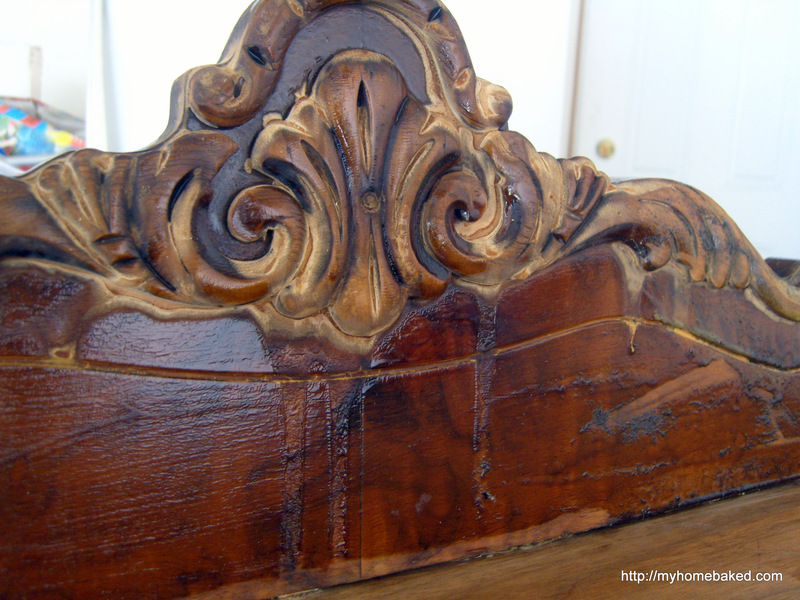 After stripping as much as I could without going crazy (I didn’t get too picky about getting every last nook and cranny in those carved areas–that extra patina gives it character, right? ), I sanded a little, wiped everything down with a tack cloth, and then brushed on some Pre-Stain Wood Conditioner. Two coats of stain (this was the fun part), and then some Paste Finishing Wax (which I much prefer to polyurethane as a protective finish). Lesson #2: A dark-colored stain covers a multitude of sins. 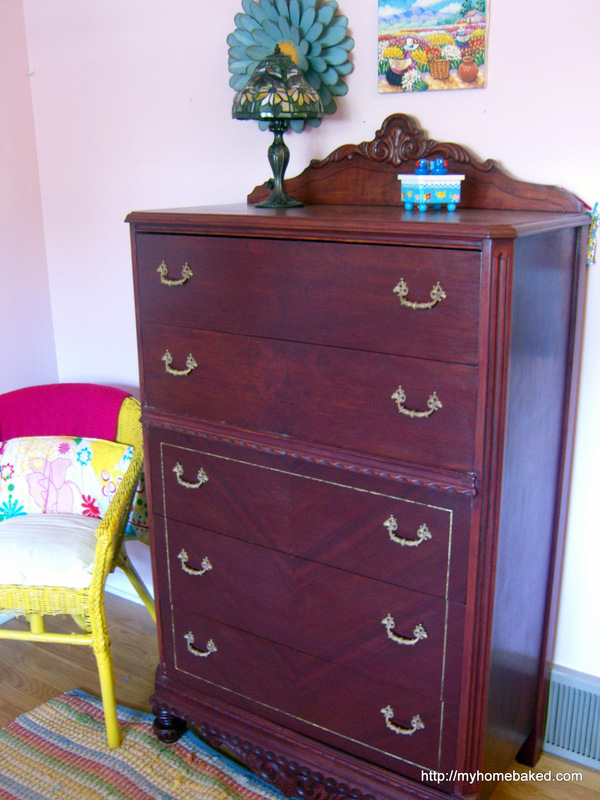 I even dug out some gold paint and applied it with a tiny paintbrush to the outline on the three bottom drawers. 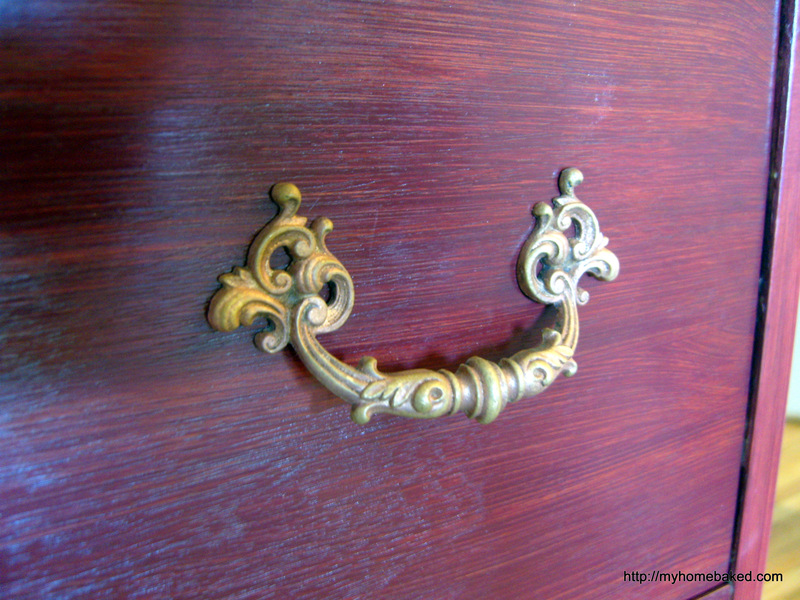 I soaked all the formerly blackened drawer handles in Jules’ homemade brass cleaner, which restored the brass finish nicely. Miss Seven helped me reattach all the handles, vacuum out the drawers (after all those weeks in the garage, we had a nice spider collection), and carry them to the foot of the stairs. 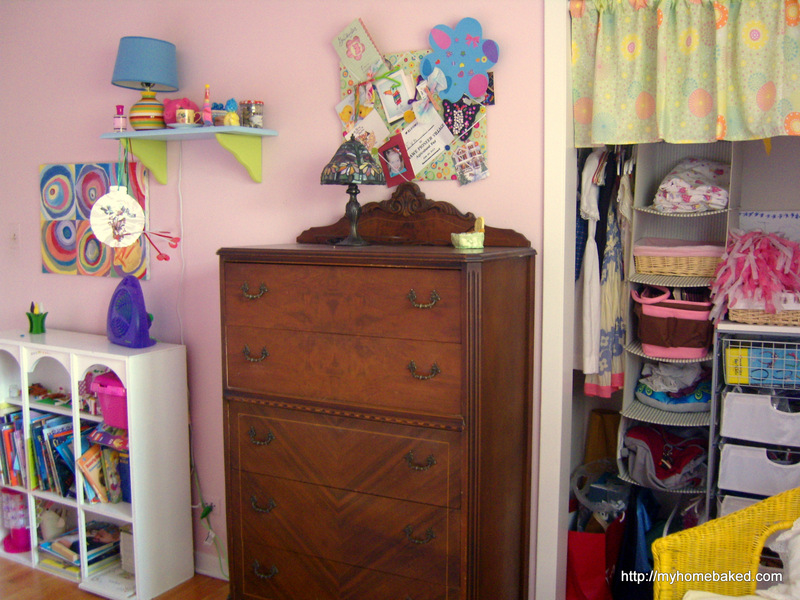 The Hub and I hoisted the dresser back up the stairs into her room, and we had a quick and dirty session sorting all her clothes into their new drawers (and filling yet another bag of outgrown clothes to pass on). It’s hard to get a good sense of the true color in these photos. The one above looks a little browner than it really is. The photo below looks a little more accurate. We are all happy with the result. It is purple enough for Miss Seven, but not too purple for me. I think it will stand out nicely once we repaint her walls from pink to a pale aqua. And as for her old dresser, I already sold it on Craigslist and got it out of the garage. love the chevron detailing! it’s so shiny and fresh. well done. Thanks! I couldn’t cover that chevron grain up! Thank you for not painting it. I was prepared to be horrified.